WHITE, SOLOMON, lawyer, farmer, businessman, and politician; b. 8 Oct. 1836 on the Huron Reserve, near Amherstburg, Upper Canada, son of Joseph White, a Wyandot chief, and Angélique Fortier; m. first January 1867 Mary L. Drew (d. 1896) of Detroit; m. secondly 25 Sept. 1898 Elizabeth Whitmore of Detroit; he had no issue; d. 11 Nov. 1911 in Cobalt, Ont. Educated in the schools of Essex County and fluent in both French and English, Solomon White was called to the bar in 1865. He entered practice with fellow Catholic John O’Connor* in Windsor. In 1868 he relocated in Cooksville (Mississauga), where he operated a prosperous grape and wine business. While there he ran unsuccessfully as a Conservative in a provincial by-election in 1873. Three years later he returned to Windsor. Resuming law, he also operated a farm near the city, raising grapes, cattle, and trotting horses. He became president of the North Essex Agricultural Society, the Windsor Land and Improvement Company, and the Windsor Driving Park Association, which sponsored professional horse-races. 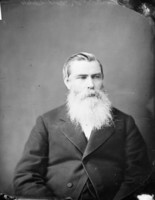 In 1878 White was elected to the Ontario legislature for Essex North. He would hold this seat until 1886 and from 1890 to 1894. His criticisms of Oliver Mowat*’s Liberal government were applauded by the majority of Tories, but other positions adopted by White isolated him within his party. Most Conservatives were demanding that English should become the language of instruction in Ontario’s French schools, but White, loyal to his mother’s ancestry and his many French-speaking constituents, resisted the trend in 1891. Even more dramatic was his support that year for annexation to the United States. He believed that Canada’s material prosperity and need to move beyond colonial status necessitated union. Conservative leader William Ralph Meredith* repudiated White’s stance in February 1892 and the Liberals eagerly exploited the rift. White went his own way too on native issues. In 1877, under the terms of the Indian Act of the previous year, Solomon and his father had been able to obtain enfranchisement by negotiating an exchange of rights on the Huron Reserve, whose lands were held in common by band members, for individual land grants. White acquired 167 acres, and his wife 50 acres, in this transaction, and they thus participated in the assimilation of the Wyandots on the reserve. But, as the first aboriginal legislator in Ontario, he virtually stood alone in contending for native rights. In 1884 he attacked the Liberals’ denial of the provincial franchise to some Indians; two years later he defended native land claims in Ontario and, contrary to public sentiment, called for clemency for those aborigines imprisoned as a result of native resistance during the North-West uprising [see Mistahimaskwa*]. This unpopular proposal led to White’s defeat in 1886. 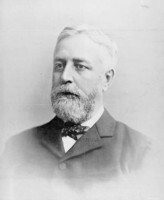 When he returned to the legislature in 1890, after a short time as mayor of Windsor, he again assailed the Mowat administration for interfering with native lands, which, he claimed in 1891, were solely “a matter between the Indians and the Dominion.” Such controversial stands helped produce White’s final defeat, in 1894. In 1905 White relocated in Cobalt, a burgeoning silver-mining centre in northern Ontario. Aided by his bilingualism, he developed a thriving legal practice there and acquired mining interests and a number of stores and houses, though he kept his home and commercial property in Windsor. In 1908 he was awarded a kc. Defeated in the contest for mayor of Cobalt in 1907, he was elected in 1911 but died later that year. His remains were returned to Essex for burial in Anderdon Township. 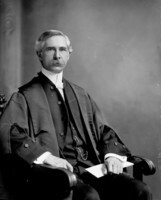 A minor political figure, Solomon White attained significance as a Tory maverick and as the first legislator in Ontario to voice native concerns and attitudes. AO, RG 22-366, no.549. Cobalt Daily Nugget (Cobalt, Ont. ), 13 Nov. 1911. Daily Mail and Empire, 14 Nov. 1911. Evening Record (Windsor, Ont. ), 13, 15 Nov. 1911. Globe, 14 Nov. 1911. Hamilton Spectator, 13 Nov. 1911. Toronto Daily Mail, 1880–86, 1890–94. C. R. W. Biggar, Sir Oliver Mowat . . . a biographical sketch (2v., Toronto, 1905). Canada, Indian treaties and surrenders . . . [1660–1906] (3v., Ottawa, 1891–1912; repr. Toronto, 1971), 2: 66–67, 118, 154-55. Canadian album (Cochrane and Hopkins), 2: 223. Canadian men and women of the time (Morgan; 1912). Charles Clarke, Sixty, years in Upper Canada, with autobiographical recollections (Toronto, 1908). CPG, 1880–87, 1890–95. Cyclopædia of Canadian biog. (Rose and Charlesworth), vol.1. P. E. P. Dembski, “William Ralph Meredith: leader of the Conservative opposition in Ontario, 1878–1894” (phd thesis, Univ. of Guelph, Ont., 1977). Dominion annual reg., 1883–84, 1886. A. M. Evans, Sir Oliver Mowat (Toronto, 1992). Ont., Chief election officer, Hist. of electoral districts (1969); Legislature, “Newspaper Hansard” (AO mfm. of the debates, 1867–1943), 1880–86, 1890–94. Peter E. Paul Dembski, “WHITE, SOLOMON,” in Dictionary of Canadian Biography, vol. 14, University of Toronto/Université Laval, 2003–, accessed April 22, 2019, http://www.biographi.ca/en/bio/white_solomon_14E.html.